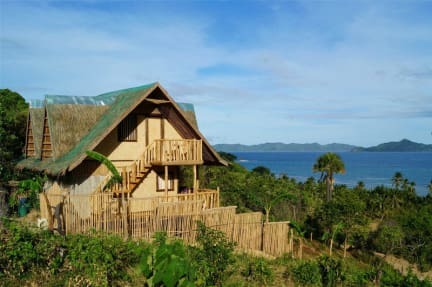 Erlittop Garden opened in December 2016 to offer travellers a relaxing experience in Sibaltan, a hidden fishing village in Northern Palawan. 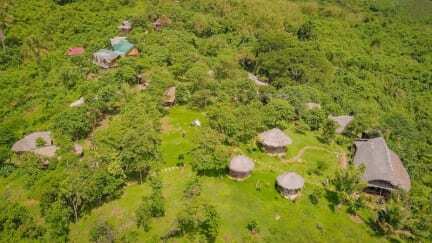 Run by a local Cuyonon family, it offers accommodation in bamboo huts with beautiful views over Sibaltan bay. Our restaurant offers a selection of local specialities and international cuisine and is open from 6:30 to 22:00. Spent a month in the Philippines and had such an amazing time here. Siboltan is an hour pass El Nido, which is well worth it. I had a scooter so was easy to explore other beaches and surrounding villages. The staff was so nice and knew my name from day one. This is not to be missed when traveling Palawan. If you want an off the beaten path this is the hostel for you. The location far from town and has majestic views of the mountains and seas. The only thing about the place is the transportation. Their partner van has a lot of stop overs. Over all, we enjoyed our stay and will definitely come back and do the private island tours again! Loved our stay here! Very peaceful and relaxing - great if you want a bit of privacy or be away from very busy areas. The view from the simplistic wooden huts is just idyllic. Food good value and convenient but found nicer places nearby. Electricity turns off at 11 so good to get an early night as it can be difficult to fall asleep in the heat without a fan. Lovely place to stay, wish we stayed here longer! Perfect if you want to get away from the hustle and bustle in El Nido. There wasn't much of an atmosphere, but that was exactly what you look for in a place like this. Bed was comfy. I had a really wonderful time in Erlittop. Not only the location and the accomodation are excellent, but also the food they serve the whole day long. I tried something different and it was every time very surprising. They offered nice trips and tours which you can do with other guests, so you get to know other people very well. You can charge your electronic devices all day at the reception and they good care of your belongings if you’re not there. Very warm and helpful people who work there! Beautiful place, remote and away from the crowds. What makes it superb is the helpfulness of the staff, and the location. The bungalows are very basic, just bed with some electric outlets that work only for few hours. The bungalows could use a little bit more of love, a simple bookshelf, cabinet or even a tiny bit of art would make all the difference. The views are killer. Lovely staff and I'd say a bit of Lord Of The Rings flair which I liked. Tasty meals at reasonable prices. There's a shared van that heads to the town twice a day for 200PHP. I had some major issues with mosquitos though. It's quite humid there and we had dozens in our hut although we never turned on the light. I heard there were huts with net-sealed windows though. Apart from that: lovely! Our stay at Erlittop was a lovely relaxing break from the busy atmosphere of El Nido and Puerto Princesa. The windows in the room didn’t have any glass - which meant airflow, but also meant lower security. But we did not find that an issue as long as our valuables were put away. The only issue was that the electricity would cut off around 11pm, turning off the fan. This wasn’t a problem for me, but my boyfriend had trouble sleeping in the heat. Overall a very tranquil place with beautiful views. Really enjoyed our time here. Be warned there is little to no wifi and electricity only between 6 and 11pm. Perfect spot to escape during a trip. Very quiet (in terms of people) but noisy where creatures/animals are concerned. Free breakfast was nice and the food at the restaurant was also tasty and not overly pricey. If you don't want to be in the middle of nowhere, essentially camping then do not stay here. We would come back! Staff were really helpful and friendly. Food was great and for a reasonable price. 5 min walk from the beach, 1 hour from town. However when arriving at the property, make sure you arrange in advance to be picked up, the van is only 200P, as opposed to the 2000P a tricycle offered, had to wait for a very long time. Scenery was beautiful, however due to being secluded very loud at night, extremely disrupted sleep! Overall, a good stay for those wanting to chill and be in an non-touristy area.